For a blog entitled Sports Diaries, one may think that darts is a peculiar sport to start with. Yet I think no sport at the moment is on the rise quite like darts with this years PDC (Professional Darts Corporation) World Darts Championships highlighting that fact. Now in its 19th year, the Championships concluded last night with Adrian Lewis taking the title for the second year in succession. The event, held at Alexandra Palace, takes place over 3 weeks, starting on the 15th of December and ending on the 2nd Janurary, with an obligatory break for Christmas, and each night at the 2,500 arena was a sell-out. Previously the event had been held at the Circus Tavern in Essex, a much smaller venue, but such is demand these days, a move to a bigger arena was essential. The size of the daily crowds at this end of year Darts competition goes to show how far the sport has come from its muted beginnings in 1994; not only is the darts great to watch but the atmosphere generated at the palace rivals that of any football ground on a Saturday afternoon, and I dare any of you to watch the video above and say you wouldn't be joining in! They pack into one of the palaces large halls on long, picnic bench style tables, settle down with their jugs of beer and their home-made banners to watch hours of sport entertainment. The personnel of the crowd too may come as a surprise, for darts now seems to be the new sport of choice for the Royals, with Prince Harry appearing in the crowd at the 2010 final and last night saw Mike Tindall and wife Zara Phillips sitting in the stands. Other celebrities at last nights final include former cricketer Andrew Flintoff and comedians Lee Mack and Tim Vine. Zara Phillips and Mike Tindall enjoying the darts last night. Darts has begun to attract large crowds consistently and TV giants Sky Sports, who showed all 72 matches of this years World Championships, have taken note. They now broadcast at least 6 major Darts events a year, sometimes showing up to 10 hours of a live action a day, with their decision to do so being justified with increased viewing figures year on year; 2002 saw 200,000 viewers for the World Championship Final in contrast with the one million that watched this years. Darts is now a global sport too with PDC UK events broadcast around the world in countries such as Australia, Holland, Singapore and the United States. No other sport in my eyes has seen such a rise in popularity in recent times; its gone from being a game played to small crowds in large pubs, to a global sport which is fantastic to watch. The money involved at the World Championships, money nowadays being an indicator towards popularity, has risen from £16,000 in its inaugural year in 1994 to £200,000 that Adrian Lewis picked up yesterday, not to mention the increase in sponsors emblazoned on the light-weight shirts the players wear. Phil 'the power' Taylor with his award in 2010. As for those who suggest Darts is not a real sport, think again. The concentration, stamina and nerve needed to throw darts consistently accurately for up to three hours shouldn't be underestimated, its a talent; we also shouldn't ignore the mental maths needed to calculate whats required to checkout! Darts is just as much a sport as football is, the attributes needed to play are just somewhat different and I think people are beginning to recognize this more and more. The players themselves are becoming recognized these days for their skills, and I don't think anyone has done more for the sport than Phil 'the power' Taylor, arguably the greatest player in the last 15 years. 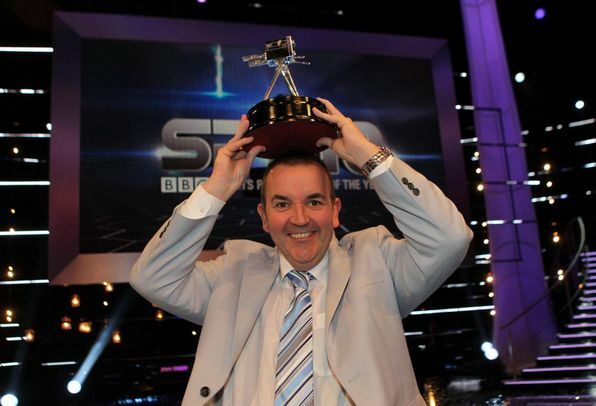 Having won the PDC World Championships a record 13 times, with the nearest record being just two wins, 'the power' helped put darts on the map and in 2010 was named as runner-up in the BBC's Sports Personality of the Year award. Taylor's achievement at the BBC SPOTY serves as the best example of the rise in popularity of darts; for Taylor to be runner-up, the first darts player ever to be involved in the award, puts darts bang on the sporting map and personally long may it stay there, for there's nothing quite like a night at the darts.